This topic contains 4 replies, has 5 voices, and was last updated by Bill Kirkley 02/08/2019 at 6:03 pm. I hesitate to even ask this question because it’s probably already been thoroughly covered in one of the threads but I’ve spent quite a bit of time searching and just can’t find it. So sorry if I’m being repetative but here’s my question; How do you make sure a blade is straight up and down or in a proper sharpening position when clamped in the tormec small blade adapter? When your dealing with FFG vs Hollow Grind vs whatever you have. The only thing I can come up with so far is to use the digital angel cube, place it back and forth on the sides of the blade (which doesn’t work well on some blades) and try to get the same angel. I’m sure there’s got to be a better, easier way. DeeR, you hit it right on the head. You use your eyeballs, your tools like an angle cube and your common sense to try to align it and record that position as best you can. At best, it’s an educated guess. If the results are you were able to sharpen your Tormec assisted, clamped knife, then consider it a success. Please don’t misunderstand me. The Tormec Small Knife Adapter is a handy helpful tool that I do sometimes use. It is not always easy to use. Sometimes it’s the only choice to accomplish the sharpening job at hand, so I use it. This is one of the reasons that use of the Tormek small knife adapter is a compromise. It involves some estimation on the vertical positioning and then there’s the problem of repeating that clamping position the next time you want to re-sharpen the knife. I try to avoid using that adapter if I can clamp a blade in another way. I measure the blade’s verticality by attaching a 1/8″ x 1″ x 3″ long piece of precision-ground steel to one side of the ‘cube. For those of you thinking “Geez!” I’m sorry, but it’s what I had laying around. I will then hold that steel edge against whatever part of the blade I can see. Often, I have to turn the steel to put it on edge. I take reading from both sides of the blade and move the handle until the blade is as vertical as I can get it. This works well with medium to large knives, but getting a steady hold against a narrow blade is tough. It’s even tougher when the pivot joint is a bit loose, a problem often seen in small knives. If the blade has a section of flat (non-ground) blade surface, the on-edge method works better. Having said all that, you’re just as well off using the eyeball method as Marc suggests. Our brains are very good at judging vertical or horizontal lines. If you are off by a few degrees one way or the other, the edge will still sharpen just fine. Any nominal error will simply result in a slightly canted edge, but the included angle will be the same and the edge will be just as sharp as if it were held perfectly vertical. Wide bevels may be noticeably different, but narrow bevels will be so similar that detecting the difference will be quite difficult. If you have an angle cube it doesn’t matter if the blade is streight. Measure the angle on each side. 5 degrees on the right and 1 degree on the left in the attached drawing. 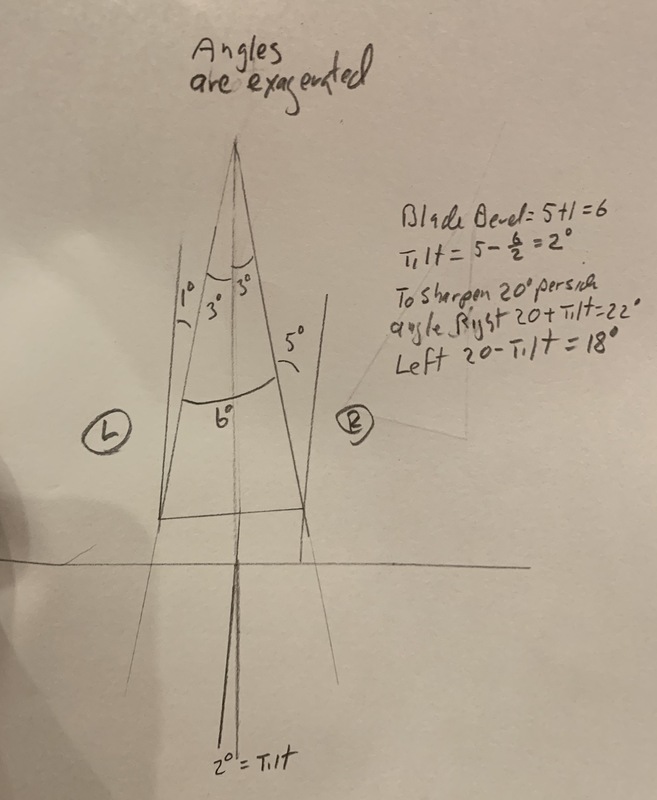 I hope the attached drawing explains how you angle your right stone 22 degrees and the left stone 18 degrees to sharpen 20 degrees per side. This reply was modified 2 months, 1 week ago by Bill Kirkley.